178 pages | 3 B/W Illus. The organization of human smuggling from the Middle East and Africa through Turkey and the Eastern Mediterranean has become a contemporary political concern throughout Europe, receiving intense and polarised media attention. This timely book reformulates how we conceive of human smuggling, challenging popular and political conceptions of the practice in Europe. This book proposes a new framework for examining the causes and effects of human smuggling in the Mediterranean, analysing the contingent patterns of human smuggling in the countries of the Eastern Mediterranean with a geographic focus on Turkey. Building on unique empirical material from fieldwork in Turkey and Greece, this book describes the rise of human smuggling as a practice, viewed through a framework of multiple 'contingencies'. Uniquely, this book includes in-depth testimonies of migrants who have survived crossing the Aegean Sea and details the strategies and tactics of the facilitators who help them. 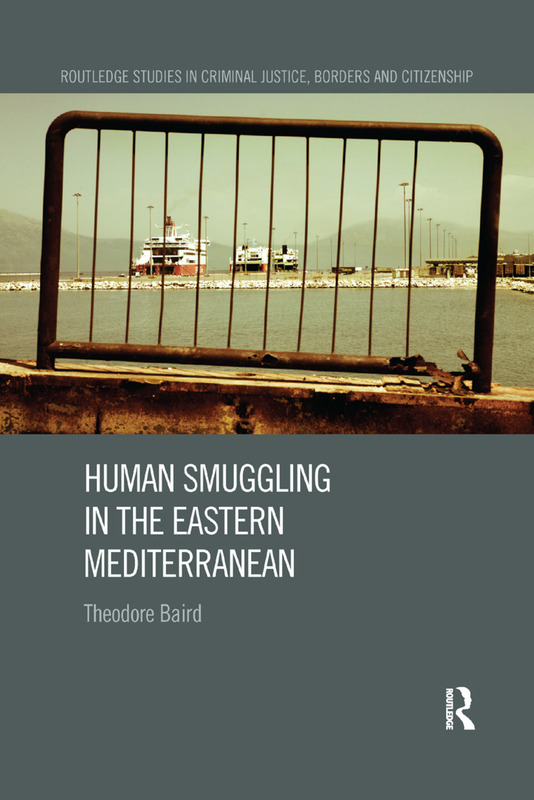 In Human Smuggling in the Eastern Mediterranean, Theodore Baird puts a human face to the tragedies occurring in the Mediterranean while maintaining that contingent historical, political, economic, and geographic forces have aligned to propel the practice of human smuggling forward. The book will be of interest to scholars working in migration studies, as well as scholars in the fields of sociology, criminology, law, political science, anthropology, and geography. "Rather than conceiving human smuggling only as a business organised for criminal profit this book shows that smuggling is part of a broader trend of social transformations with the most innovative chapter being on the links between smuggling and state formation and rebellion in the context of Kurdistan. This book about smuggling in the Eastern Mediterranean is essential reading for anyone who wants to understand not only the internal structures of human smuggling but also its links to the external environment." "This book essentially contributes to understanding human smuggling in the Eastern Mediterranean and beyond. It is inspiring how it addresses human smuggling in the context of broader (geo)political and social transformation processes at the local, regional and global level. It not only complements existing knowledge but sparks new avenues of discussion on human smuggling. A much needed perspective and a great enrichment." "This book presents a fascinating and well discussed account of human smuggling in the Mediterranean." Theodore Baird is a post-doctoral researcher in the Faculty of Law at VU Amsterdam, the Netherlands.